This is the first described dinosaur. From the middle Jurassic England, this animal grew to a length of around 30 feet. This is one of the only known theropods from the middle Jurassic, it was originaly restored as a quadraped. Edmarka rex is a possible late surviving Megalosaur from the late Jurassic of North America. Some scientists consider it to just be a species of Torvosaurs, as Megalosaurs and Torvosaurs are thought to be closely related. I believe the only known specimen is thought to be somewhere between 36 nd 42 feet long. Tyrannosaurs part the Third: T. rex! 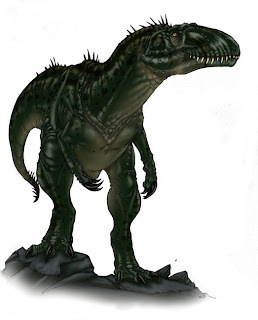 Tyrannosaurs part the second: Tarbosaurus Attack!